Hylaeus (Rhodohylaeus) proximus, from PaDIL. Contains: Andrenidae, Melittidae, Megachilidae, Apidae, Halictinae. The Apiformes, bees, are a diverse and well-marked clade of herbivorous wasps, characterised primarily by the presence of at least some plumose hairs on the body (though these may be few in some groups). Bees have been divided between long-tongued (Megachilidae and Apidae, with the first two segments of the labial palpus elongate and flattened) and short-tongued groups (the remaining families, with the palpus segments cylindrical and not strongly differentiated); however, phylogenetic studies indicate that the long-tongued clade is nested within the short-tongued paraphylum. The earliest definite evidence for bees in the fossil record comes from the Late Cretaceous (Maastrichtian) (Engel 2001). Characters (from Engel 2001): Some setae branched or plumose; subantennal sutures internally connected to fan-shaped sheet of tentorium; labrum thickened basally and attached at clypeal margin; proboscidial fossa opened onto posterior surface of head capsule; cardo not broadened apically, approximately parallel-sided; suspensorium of paraglossa with sparse setae or bristles; mesotibial comb present; dorsoventral length of mesocoxa about equal to distance from summit of mesocoxa to hind wing base; metabasitarsus broader than following tarsal segments, without concavity or strigil; cu-a of hind wing shorter than second abscissa of M+Cu; T7 of female divided into two hemitergites. [E08] Exley, E. M. 2008. A replacement name for the bee Euhesma sulcata Exley (Hymenoptera: Colletidae: Euryglossinae). Records of the Western Australian Museum 24 (2): 215. [OC01] OConnor, B. M. 2001. Historical ecology of the Acaridae (Acari): Phylogenetic evidence for host and habitat shifts. In Acarology: Proceedings of the 10th International Congress (R. B. Halliday, D. E. Walter, H. C. Proctor, R. A. Norton & M. J. Colloff, eds) pp. 76-82. CSIRO Publishing: Melbourne. [R55] Rayment, T. 1955. 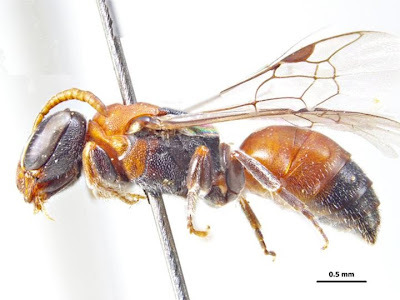 Taxonomy, morphology and biology of sericophorine wasps with diagnoses of two new genera and descriptions of forty new species and six sub-species. Memoirs of the National Museum, Melbourne 19: 1-95. [T27] Thomson, G. M. 1927. The pollination of New Zealand flowers by birds and insects. Transactions and Proceedings of the New Zealand Institute 57: 106-125. [YHT05] Yates, C. J., S. D. Hopper & R. H. Taplin. 2005. Native insect flower visitor diversity and feral honeybees on jarrah (Eucalyptus marginata) in Kings Park, an urban bushland remnant. Journal of the Royal Society of Western Australia 88 (4): 147-153.